Announcement Iris van Hulst is a product design student from Amsterdam. She just started a unique jewelry collection. Mostly she got inspired by nature. She loves organic and geometric shapes. 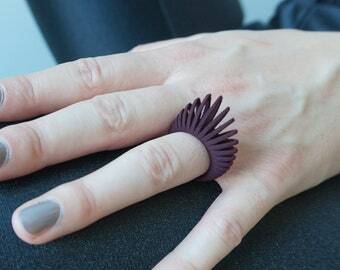 Using a 3D printer, she designs her unique jewelry. Her jewelry is printed in nylon, this is a strong and flexible material. Iris van Hulst is a product design student from Amsterdam. She just started a unique jewelry collection. Mostly she got inspired by nature. She loves organic and geometric shapes. 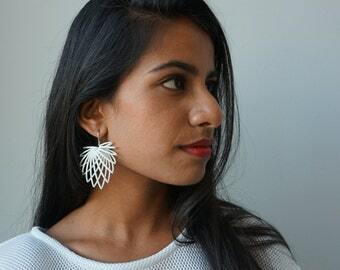 Using a 3D printer, she designs her unique jewelry. Her jewelry is printed in nylon, this is a strong and flexible material. Prachtige vormgeving, intense kleur...helemaal blij mee! Many compliments on the first day I wore. Very unique! Thanks.